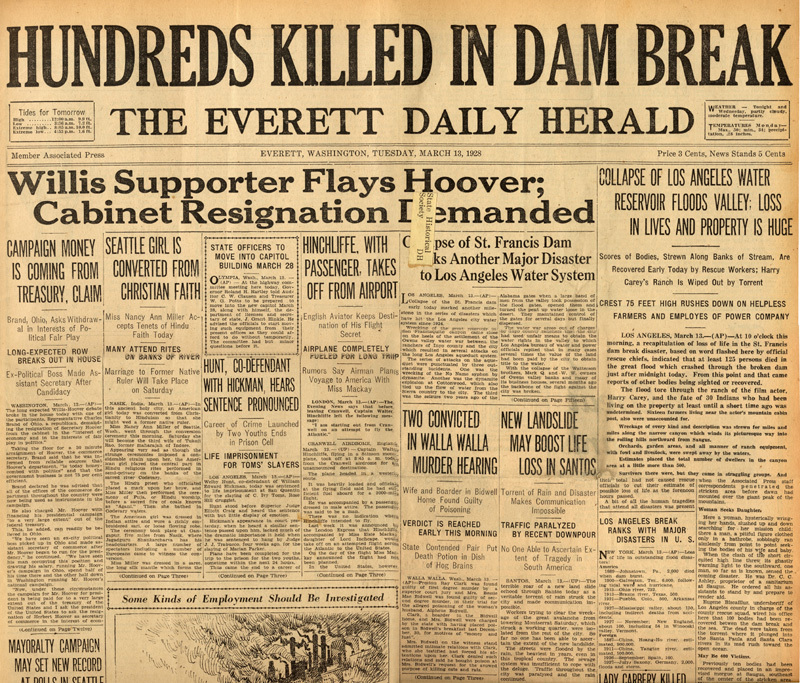 Everett Daily Herald: HUNDREDS KILLED IN DAM BREAK, 3-13-1928. HUNDREDS KILLED IN DAM BREAK. COLLAPSE OF LOS ANGELES WATER RESERVOIR FLOODS VALLEY; LOSS IN LIVES AND PROPERTY IS HUGE. Scores of Bodies, Strewn Along Banks of Stream, Are Recovered Early Today by Rescue Workers; Harry Carey's Ranch is Wiped Out By Torrent. CREST 75 FEET HIGH RUSHES DOWN ON HELPLESS FARMERS AND EMPLOYES OF POWER COMPANY. Collapse of St. Francis Dam Links Another Major Disaster to Los Angeles Water System..
LOS ANGELES BREAK RANKS WITH MAJOR DISASTERS IN U.S.
As can be seen in this Everett, Washington newspaper from March 13, 1928, the St. Francis Dam disaster was big news and made huge banner headlines all over the country when first reported in the press. Today this second largest disaster in California history is mostly forgotten in the rest of the country but well remembered in the Santa Clarita Valley.